running into Bruno in Capri. Francesca walked down the main street, looking desperately for a pharmacy where she could buy a bottle of aspirin–something to alleviate the splitting headache she’d developed during the shoot. She was still wearing her work clothes–long, skinny white jeans, a slouchy Alexander Wang navy t-shirt, and K Jacques sandals, but she’d left her big Bottega bag in her hotel room and carried only her zippered Valextra wallet. She’d spotted the green sign of a pharmacy about a block down the street when she heard someone calling her name. She looked across the street to a sidewalk cafe. A man waved at her and she walked across to meet him, realizing as she walked that it was Bruno, the boy who had lived in the villa next to the one Marco and Letizia rented when they were children. Bruno was Ricci’s age, several years older than Francesca, and she hadn’t seen him since the summer before he’d left for university, when she was only thirteen. “I’m working for a bank,” he answered, vaguely, and Francesca knew from his dismissive tone that he did something similar to her brother, and it was the kind of work one didn’t care to talk about. “But you, you’re a big photographer now,” he said. “I’ve kept in touch with your brother. He’s told me about your career. You were such a funny little kid,” Bruno said. “I travel a lot,” Francesca explained. Also, she did not explain, she lived five minutes from Ricci and hardly ever saw him. She wasn’t surprised at all. Bruno had been a gawky teenager–she remembered that distinctly. He was a nerd, so her brother had reluctantly recruited him as a sidekick, primarily because he had a boat. It was just a dinghy, but it meant that Ricci wouldn’t have to ask Marco to borrow his tender, an advantage that more than compensated for the size of the boat. If Bruno had had a dinghy as a child, Francesca was pretty sure he now had a yacht. All traces of his former awkwardness had been polished out by education and corporate life, and he seemed entirely comfortable and confident sitting across from her, all Rolex Milgauss and Lacoste polo, a successful businessman on holiday. 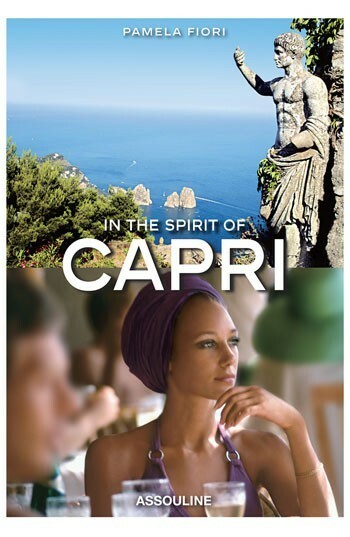 “What are you doing in Capri?” she asked him. “We can take my scooter–for old times,” Bruno said, gesturing to a black Vespa parked nearby. They drove across the island quickly, with Bruno taking the back roads and shortcuts–Francesca remembered he had been obsessed with maps and orienteering, another reason Ricci found him useful. With the wind in her hair she forgot all about her headache. Bruno pulled onto the street where they used to spend their summers and parked the scooter halfway between the two villas. They seemed both more and less imposing than they had when she was a child, she thought–more, simply because of all the work the new owners had done to the homes, lots of additions and landscaping, a swimming pool at Bruno’s old house and a tennis court at Marco’s. But the house that had seemed so endless to her as a child, where she could hide for hours on rainy days and never be found because it had so many rooms, that same house looked small now in light of all the other massive homes she’d seen in the years since. She and Bruno stood silently in front of the houses. “I thought it would help me remember him if I came here,” Francesca said flatly. Bruno looked at her quizzically.